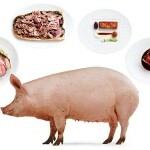 Is it safe for your dog to eat Pork? Read more to find out. Dogs can eat pork. 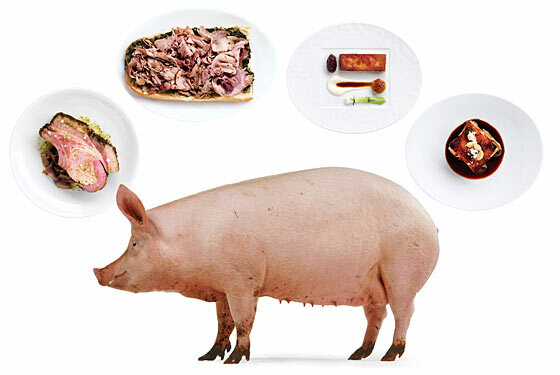 Pork by itself is about as safe as beef, chicken, and other meats. For cooked pork such as bacon, ham, sausage, or ribs be very careful with the seasonings. Seasonings that contain garlic or onions are especially harmful to give your dog. For raw pork, there is a small risk of being infected with trichinosis (also known as trichinellosis). This disease is caused by intestinal roundworm. Both humans and animals can become infected from eating raw or undercooked meat, whether it’s the pork from pig or the beef from cattle or all other meats. Trichinosis can lead to muscle soreness, pain, and swelling in the upper eyelids. To prevent this disease, make sure all fresh pork products are properly cooked. For extra precaution it’s recommended to freeze pork for 3 weeks to kill the roundworm parasite. The disease is not common in the United States. What do other dog owners have to say about whether their dogs can eat Pork or not? See comments below. I own hunting dogs in the SW Florida region. We hunt Feral/Wild Hogs. I currently feed all my dogs a meat diet consisting of Boiled Pork. I include the hair, skin and meat, usually removing all bones pretty simply after the meat is boiled for several hours. The dogs look FANTASTIC. Their coats are full and shiny, they defecate hard pellets which are much easier to clean up and the cost, lets just say I dont have much cost but the preperation is a little of a pain. I boil the meat on a turkey cooker with a propane tank. I then take a knife and big fork to cut the meat in 6-8 inch peices (I give hair and skin as well). Its working for me and my pooches……. My dog will not eat pork because of religious reasons!! Abdullah,you are a muslim, can you keep a pet dog????? Never, Ever feed raw pork to a dog. Can dogs eat cooked pork that has been in the microwave overnight? My dog ate gnawed on a bone of smoked pork shoulder, not even much anything on it, and he threw up/had diarrhea for two days!!! I know other dogs that are fine. Maybe he is allergic or just isn’t used to much people food. Hi my name is Sarah Kelly and I have a dog and today she ate a raw chicken is that mornal for a dog I’m not sure and my family is wandering? Our vet says tha there are 4 things a dog should never eat – pork, onions, grapes and garlic. Our vet never to give a dog pork, garlics, onions and grapes. Know if dogs can or can't eat Pork? Help other dog owners by leaving a comment.